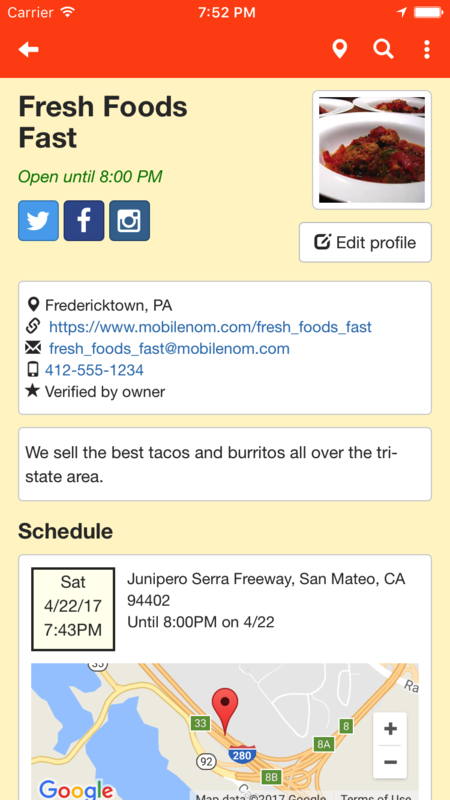 This guide is designed to assist food trucks with using the features of the Mobile Nom food truck finder application. If it doesn't contain the answers you need, don't hesitate to contact us at support@mobilenom.com. 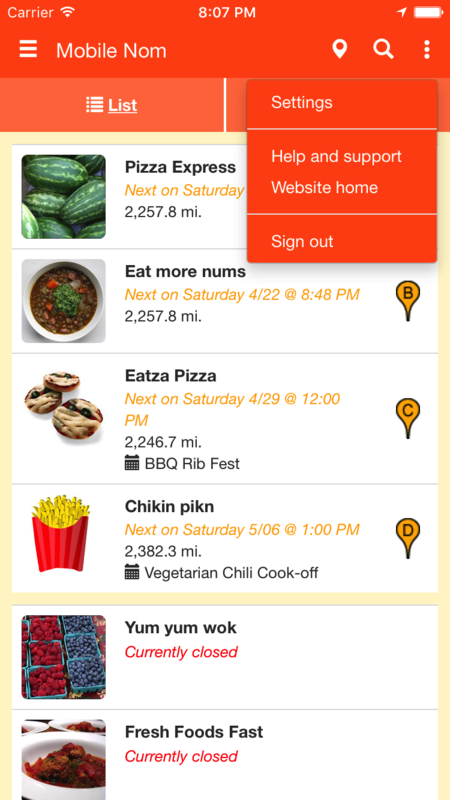 Click the button in the upper left corner of the screen to reveal the sidebar menu. From the sidebar menu, click on the "Sign in" button. 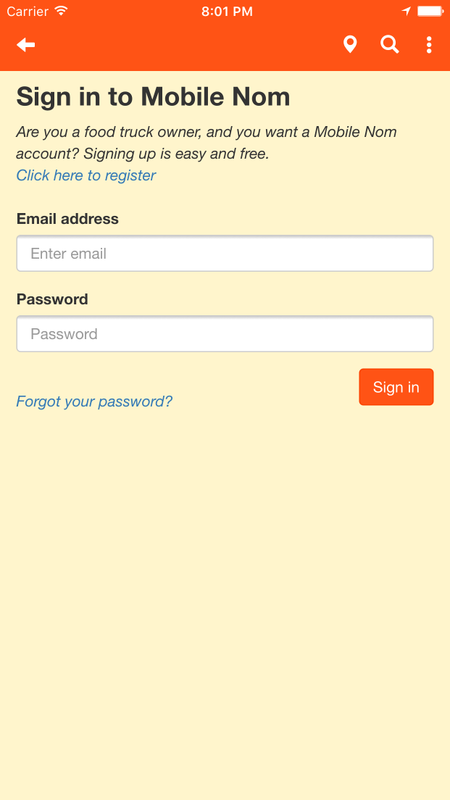 On the following screen, enter your email address and password that you used when you registered. If you forgot your password, click the "Forgot password" link and follow the instructions to reset your password. If you haven't yet signed up for an account, follow the "Click here to register" link and follow the instructions to create your free account. 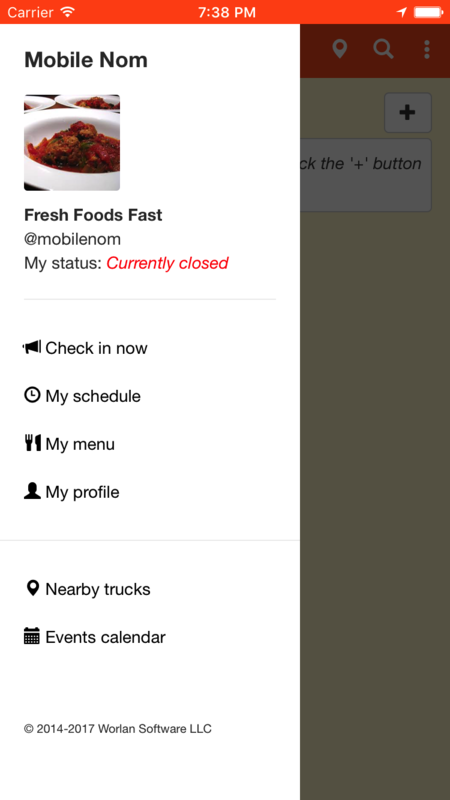 This is the sidebar menu that food trucks will see once they are logged into their accounts. From the sidebar menu, click on the "My Profile" button. On the next screen, you'll see your profile page as it appears to the public. To edit your profile, click on the "Edit profile" button, located in the top right under your picture. On the "Edit profile" screen, you can change any of the information which occurs on your profile page. When you're done making changes, click the "Save" button. Currently, we do not support updating your image through the app. If you would like to change your image, please send your new image file to support@mobilenom.com. Your image file should be square in dimensions. The recommended size is 400x400 pixels. 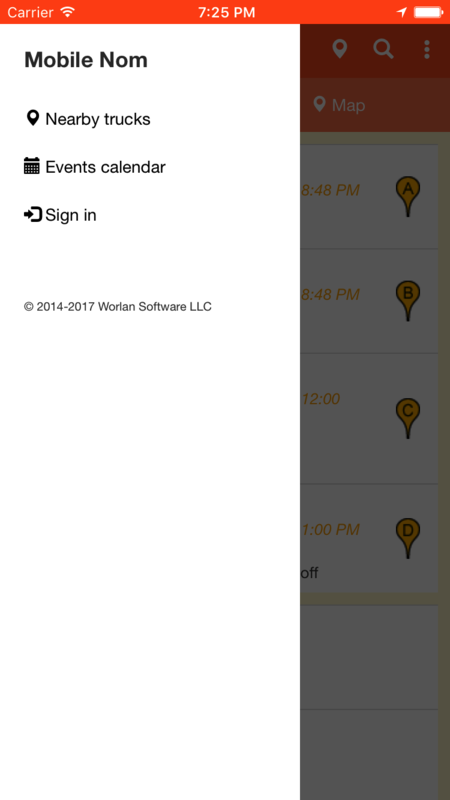 Checking into a location, or "Checking in" for short, allows you to set your current location which will be visible to users of the app. 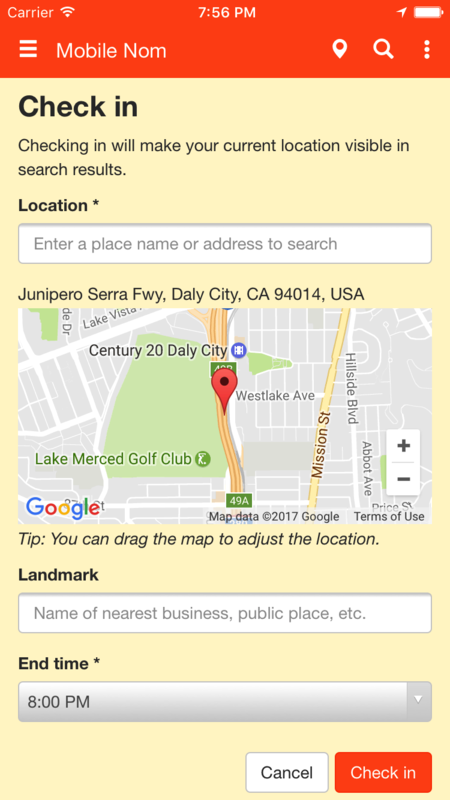 When users search for nearby trucks, this location will be compared to the user's location, and the trucks closest to them will be shown first. Enter the nearest landmark to your location. This can be a business name, public place, etc. that may help people more easily find you. 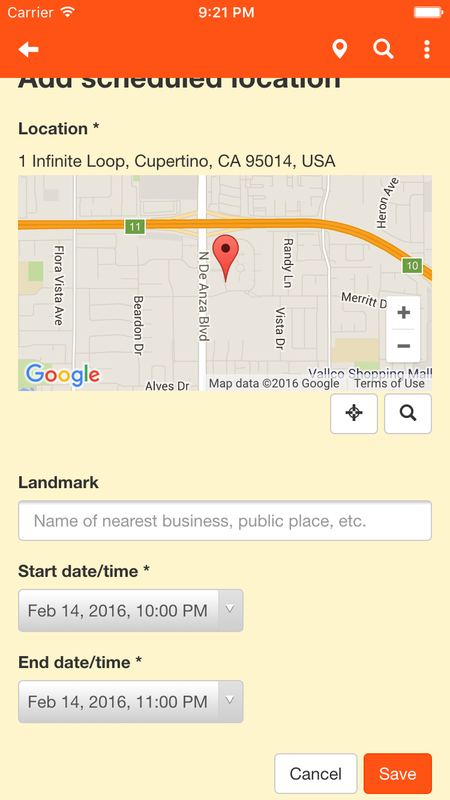 By creating future locations, your location at that time will be automatically shown in search results when the time arrives. It's the same as a "Check in", except that it occurs in the future. 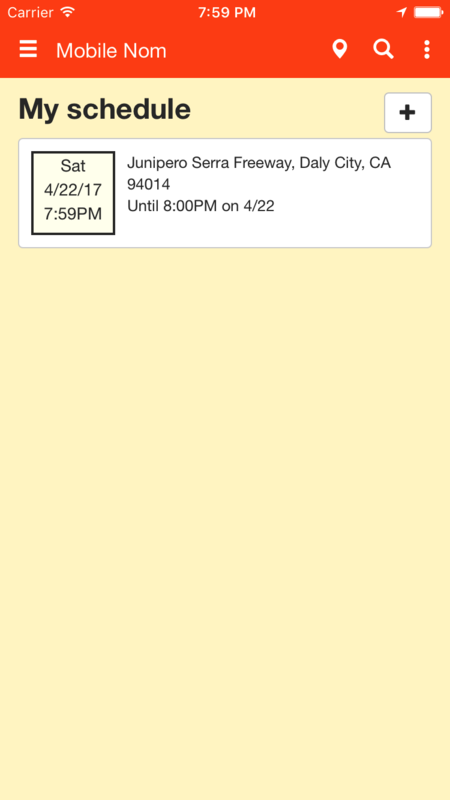 From the sidebar menu, click on the 'My Schedule' button. On the next screen, click the + button in the upper right hand corner. If you need to reset the map center to your current location, click the "crosshairs" button underneath the map. 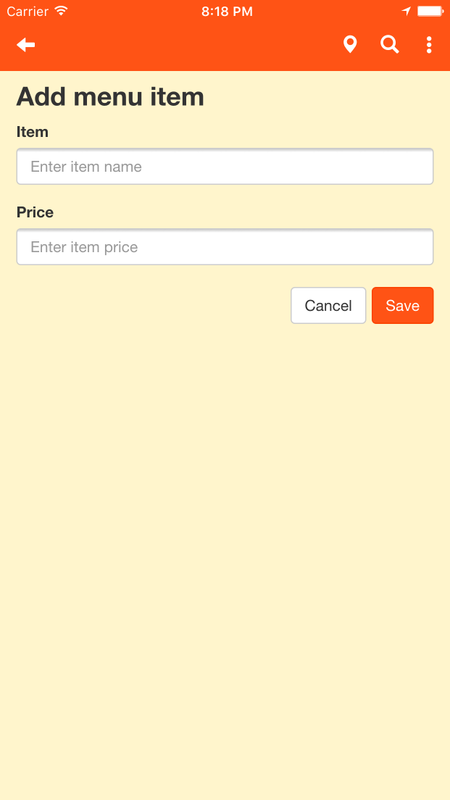 The menu feature allows you to list all, or a sample of the items which you sell, along with an optional price. 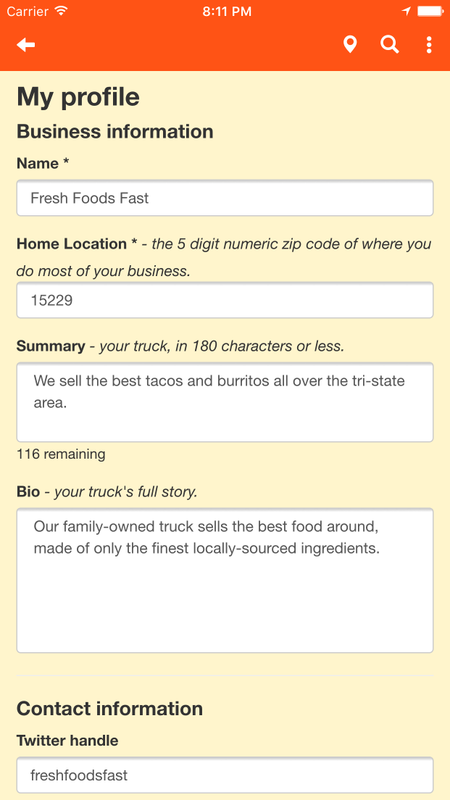 Truck menus are considered when a user performs a search. So, for instance, if a user searches for the term "pizza", and you have "pizza", on your menu, you'll show up in search results. 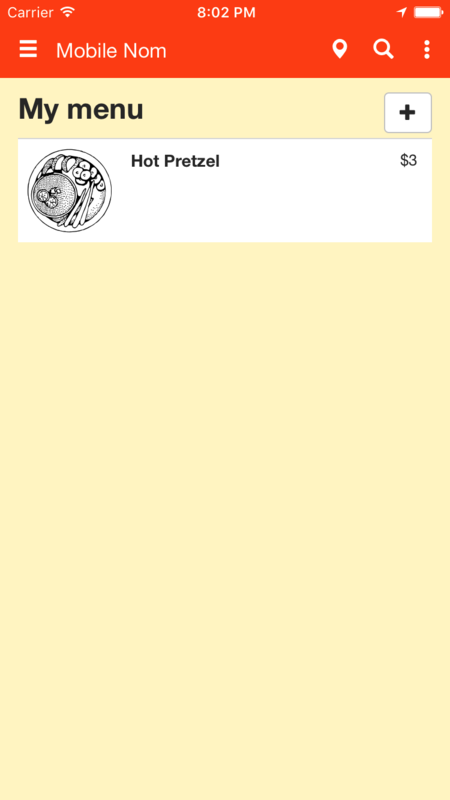 From the sidebar menu, click on the 'My Menu' button. 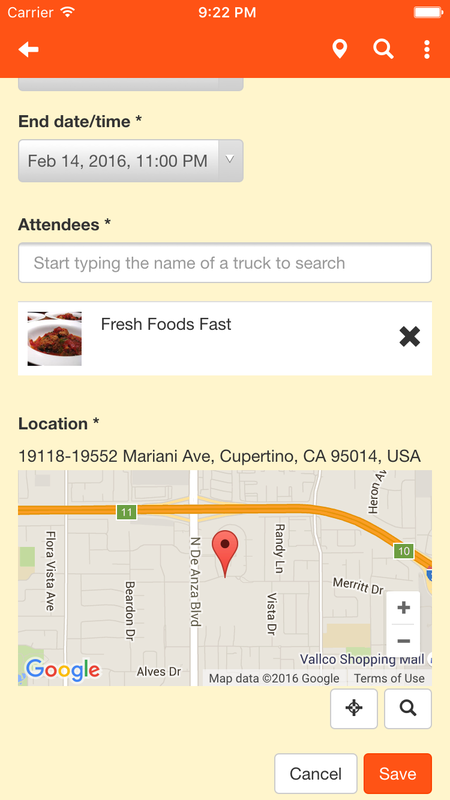 Events are similar to the "Check in" and "Schedule" features, but they allow you to share a check in with other food trucks. 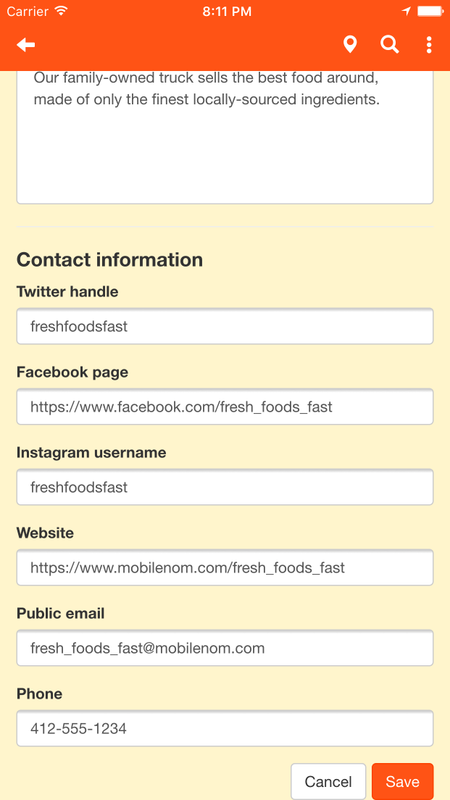 This is a great way to promote your upcoming food truck roundups, rodeos, etc. 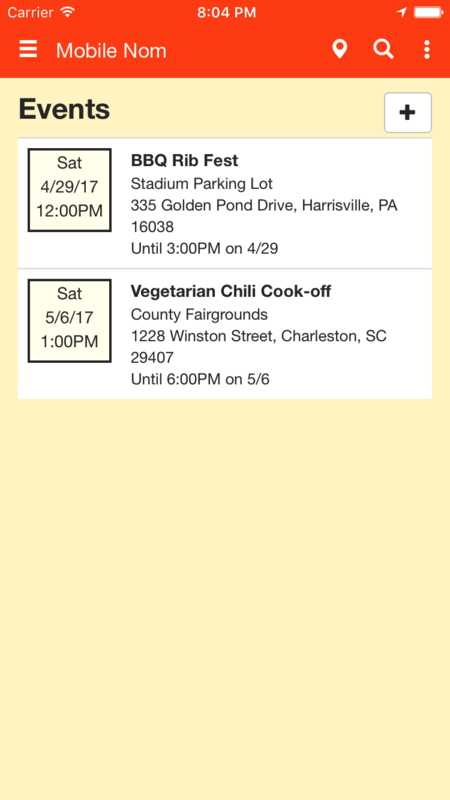 Any registered food truck can create an event. 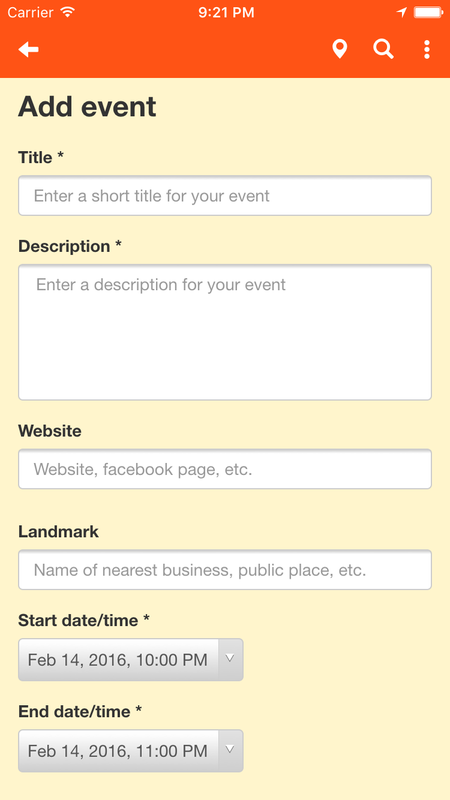 Once an event is created, any truck that is listed as an attendee is able to edit it. From the sidebar menu, click on the 'Events' button. Enter the start/end date and time. From the "Attendees" field, choose the names of trucks other than yours that will be attending the event. Start by typing the name of a truck into the search field, and select the correct one from the dropdown menu once it appears. 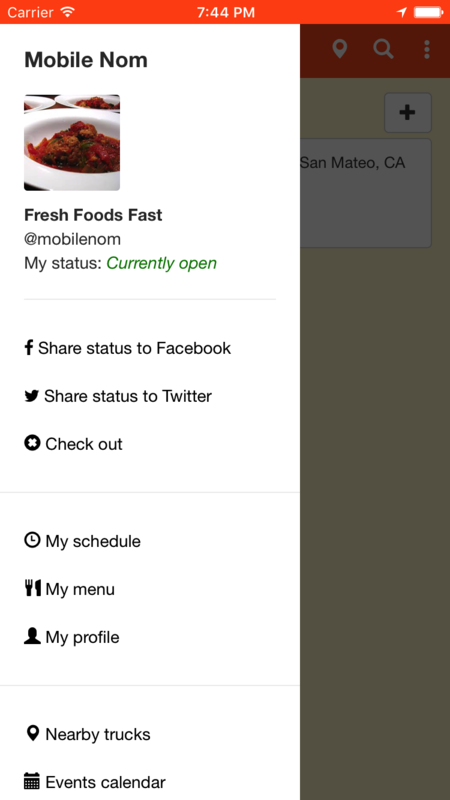 You can connect your Twitter account to allow Mobile Nom to post tweets on your behalf about your scheduled locations. 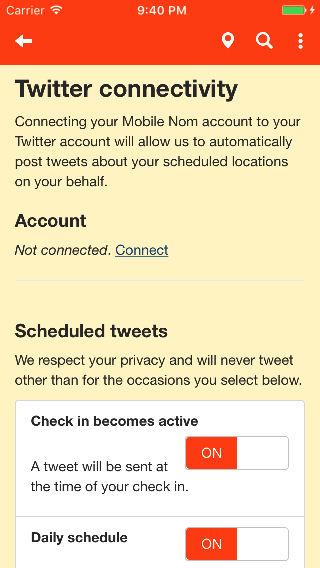 This makes it extremely easy to keep your followers up to date with where you will be. From the options menu in the upper right corner, click "Settings". Click the "Twitter connectivity" option. Under the "Account" section, click "Connect". You'll be directed to Twitter's website. 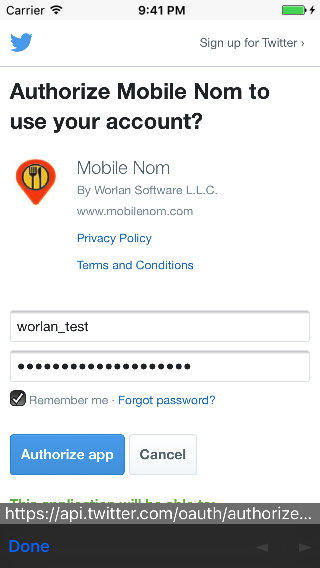 Enter your Twitter username and password, if prompted. 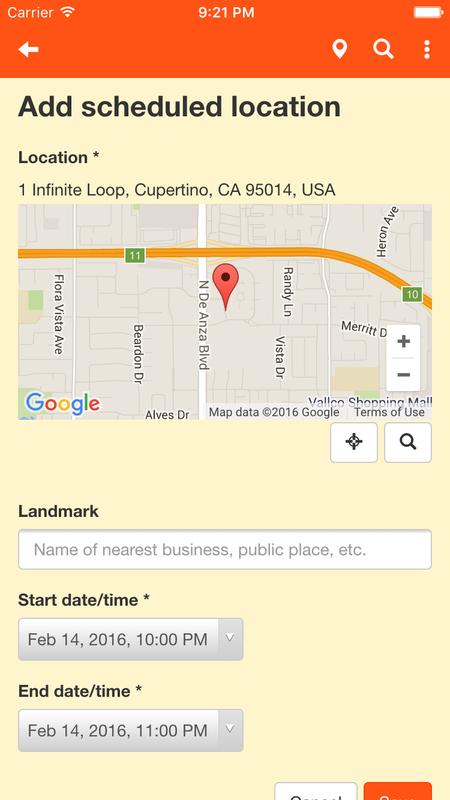 Click the "Authorize app" button. 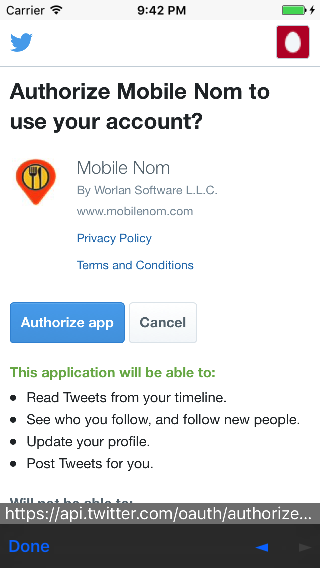 Click the "Authorize app" button. 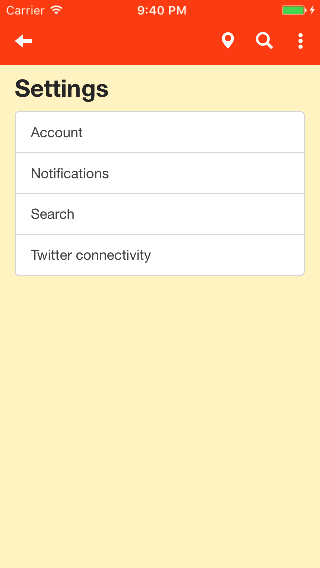 After a short while, the app should refresh and you should see that your Twitter account is connected successfully. To finish, review the "Scheduled Tweet" settings and turn on any automatic tweets that you wish for us to post on your behalf.